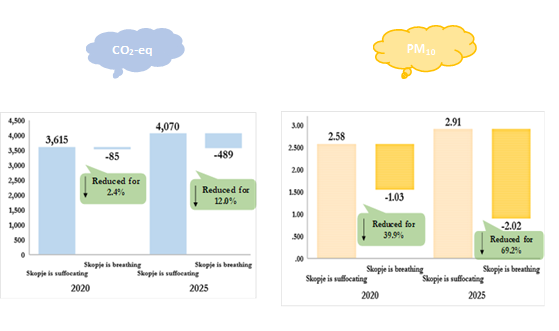 As a response to this raising concern, in 2017 a heating study “STUGRES” was commissioned on the territory of the city of Skopje and 17 municipalities that are part of the Skopje agglomeration, aimed at examining the ways in which different household heating practices affect the greenhouse gas emissions (CO2, CH4, N2O), local pollution (PM2,5, PM10, CO, SOx, NOx) and air quality in the capital. What has been done differently? Using the new innovative locally developed mobile app - Placeformer and using City of Skopje Innovation Center - Skopje Lab testing environment a pool of geo-tagged data has been collected in only 3 weeks, much cheaper and faster than standard data collection methods. The proposed measures should also reduce the consumption of energy obtained from GHG high emission energy sources and should ensure their replacement with low-carbon fuels, as well as promote the use of technologies that will have minimum effect on local pollution. Moreover, on top the combined effect of implementing all three measures together is much greater than the effect of measures implemented individually. ​STUGRES turns challenges into opportunities, making an impact while benefiting the City of Skopje and its citizens.